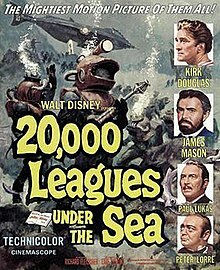 Disney cooked up “a whale of a tale” in 1954 with their epic adaptation of Jules Verne’s novel, 20,000 Leagues Under the Sea. Their fifth live-action movie at the time, 20,000 boasted the biggest budget for a single film under the Disney banner and required the use of other studio backlots and the only CinemaScope lens held by 20th Century Fox. The proof is in the pudding; not a dollar is wasted and is in abundance upon the screen. But there’s only so much that amazing set design can yield. The story itself is a lumbering 127-minute giant with enough filler to make a hearty meal. 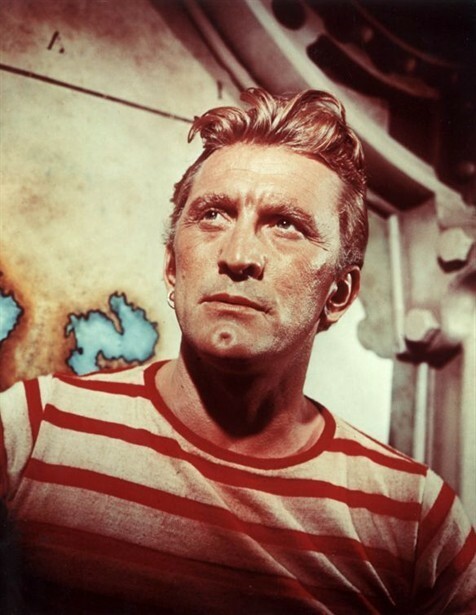 Sailor Ned Land (Kirk Douglas) and Professor Aronnax (Paul Lukas) investigate a mysterious “sea monster” that ends up being a submersible created by the reclusive Captain Nemo (James Mason). When Nemo takes Land, Aronnax, and Aronnax’s manservant Conseil (Peter Lorre), the group discovers the mysteries underneath the ocean blue. It’s well-documented how the rise of television brought about “roadshow” films with CinemaScope aspect ratios and brilliant Technicolor, all hoping to work as inducements for audiences to spend their dollars in a movie theater. With Disney, they best known for their animation and being a studio catering to children. Their live-action department hadn’t yielded any huge hits (try to name the first four Disney live-action films), and 20,000 Leagues Under the Sea’s success cemented the validity of their live action department. After this film bigger stars were attracted to work on projects, and (unfortunately) the animation arm of the studio went from releasing 2-3 features a year to about 1-2. 20,000 Leagues is a prestige picture and adventure film for kids and the balance works rather well. For every fight with a giant squid there’s Ned’s interactions with Captain Nemo’s seal, Esmeralda. The only fans sure to miss something is the musical fans. Sadly, the film boasts one song, Douglas’ rendition of “Whale of a Tale,” a jaunty sea shanty that invigorates the opening. After that the audience gets to sit back and revel in the splendor of the production design. Nemo’s submarine, the Nautilus, is exquisite. The steampunk design of the sub itself, and the opulence of Nemo’s suite within enhance the already magical and futuristic aura. The opening of the windows to see under the sea is like the curtain opening before an epic stage show. There’s also some wonderful underwater photography going on as Nemo and crew explore the fathoms below. But the excessive eye candy on the set plays like a distraction from how slow-moving the sub (and the movie) are. The film’s structure settles into a complacent “Big Action Scene” followed by lengthy dialogue exchanges before seguing into another “Big Action Scene.” Every moment is telegraphed and elevated to an event which only makes the moments where nothing happens, or at least nothing on a scale as the action, boring. Most audiences remember the giant squid battle, and for 1954 it’s a fun sequence. The CinemaScope lens prevented close-ups, so when the crew is flailing in the arms of the giant squid, you see everything and can suspend disbelief enough to assume it’s really happening. But that’s the film’s lone memorable moment, and it’s probably difficult for fans of the movie to recall much outside of that lone moment. As I mentioned previously, this was the first time serious stars came down off their pedestals to work for a studio catering to children. Both Douglas and Mason were coming off some serious troubles; despite what time’s done, Douglas’ work from Ace in the Hole till this wasn’t successful, while Mason was nursing the loss heard round the world after failing to secure a Best Actor win for A Star is Born (still an insane snub). Reviews of the movie cite Mason as ham-fisted in his portrayal of Nemo but that couldn’t be further from the truth. If anything, I was turned off by Douglas, who required his character be given additional fighting sequences and an introduction with two buxom women on his arm in order to perpetuate his image as a ladies man. Disney may have been a studio making kid’s films, but that’s no reason adults couldn’t see Douglas as a man who knew how to get women, apparently. Douglas’ Land is the typical muscular male with a quick fist and biting wit. However, the script almost forces Land into an antagonistic relationship with Nemo, turning him into a children finding ways to annoy the parent. Mason plays Nemo stoically. He’s given more meat than Ned Land’s “wine, women, and song” persona, and Mason’s given some good material regarding his hatred of a world unready for the discoveries he’s uncovered. 20,000 Leagues Under the Sea is a whale of a tale and its production design is unparalleled, but it’s a long slog with several start/stop moments.